The power bank is in the essence same device as the battery pack. Different names should not confuse you anymore. Modern marketing gurus just needed something new to sell. So they created a new name for the same device. The name is modern, strong and good sounding, and probably it boosted sales. You may call it however you like, the point is it is the same device. Power pack contains 32 old Nokia BL-5CT batteries. It is able to completely recharge smartphones from 8 to 15 times depending the phone type. So at the end, it looks like this. It is 7 cm wide, 5 cm high and 11 cm long. It weights 800 grams. I mounted standard car lighter plug. 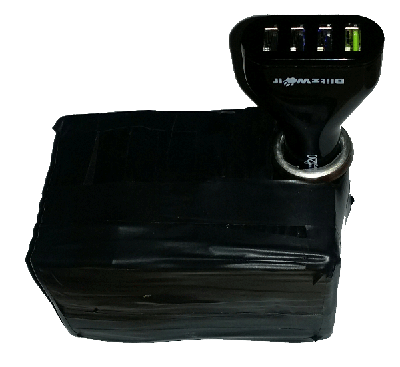 It means that battery pack can power many devices made for in car use directly. It`s not something that you can carry in your pocket since it is too big, but for longer off the grid occasions like camping it is a perfect. It can recharge your phones many times, power up your camping light, DC – AC converter and many other gadgets. This is my most used scenario for the pack. When on camping I plug in this great Blitzwolf charger, and the whole family is provided with enough juice to recharge phones for few days.This is the example of reusing technical waste. I had many of these old cell phone batteries and I put them to good use again. I ended up with the capacity of 8 Ah and voltage of 14.4 V. There is also a joy of using your own creation and that is the biggest of all rewards. Sir Oliver – Hello Bing how is the brother?